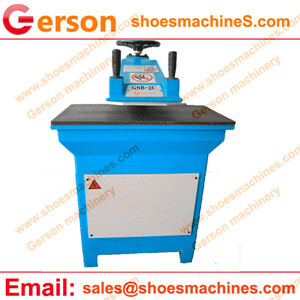 Leather Shank Buttons clicker press machine fits for cutting single or multi layer nonmental materials. 1.The swing arm die cutting machine is a very capable entrylevel machine, it is the workhorse for many die cutting applications..
2.Both hands to operate the switch to guarantee the safety of operators. 3.Rotation of swing arm is flexible, and operation and materials selection is convenient. 5.Use fly wheel inertia stored energy to save energy.